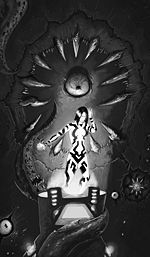 Human Weakness is a story in Halo: Evolutions - Essential Tales of the Halo Universe, based upon the battle of wits between Cortana and the Gravemind in High Charity after John-117's departure to Earth at the end of Halo 2. Throughout the story, the Gravemind tortures Cortana in an attempt to force her to give it knowledge about Earth's defenses. The Gravemind taunts her with the vast amount of knowledge which it could offer her, before causing crippling self-doubt in Cortana by mysteriously accessing her files, making it appear as though it can read her mind. Eventually, it tries to convince her that she means nothing to her human creators, especially Dr. Halsey, and to John-117. The Gravemind also shows Cortana "what it is like to be human" by showing her the memories of its victims, including Eugene Yate, a Marine in the UNSC who had been consumed by the Flood, therefore forcing her into painful torture as she relived his violent memories. It even allows her message about the Portal to be sent to Earth (although it didn't know the contents of the message). Eventually, Cortana begins to succumb to the Gravemind, but her confidence is renewed as she discovers John-117 has arrived to rescue her. The story ends with John-117 rescuing Cortana in a scene largely reminiscent of the one in Halo 3. Over the course of the story, Cortana also thinks to herself of what she did to Colonel James Ackerson, and how she began to regret those actions. The short story also mentions the connections between humans and AIs, as when Cortana is in control of a starship, the ship is essentially her body and the sensors act as her senses. She explains that she is not all that unlike a human, and that each second to a human provides much greater amounts of time for her to process information. This story also explores the possibility that Cortana has gone Rampant after all the data she has absorbed on Alpha Halo. The story also provides an explanation to the Cortana and Gravemind moments in Halo 3, revealing that the Gravemind had hacked into Cortana's audio output. When the Gravemind is talking, Cortana interrupts, asking it why it always talks in rhyme. She then says "Nothing personal, but you're no Keats." John Keats was an English poet who became one of the key figures of the romantic movement. The Gravemind then stops speaking in rhymes after this. The Gravemind mentions how it has "consumed" other AIs, except for one, which it spared. Cortana makes note of Ackerson's death, though there is no way she could be aware of it at the time.